What level and age do you take? I take students ranging from beginners as young as eight, to people who’ve been playing for 20 years looking to learn a different style. I’ve been playing for over 5 years but don’t seem to be getting any better, how come? Many people come to a roadblock after playing for a few years and find it hard to improve because they’re missing a few simple fundamentals which keeps them from connecting all that they know. Much like links, connected together they become a chain and unconnected they are just links. The idea is to add more links to create a longer chain. I have friends who are self taught, do I really need lessons? If you’re a beginners, taking lessons from the onset will keep you from developing bad habits that will hold you back, these habits take a lot of time and energy to correct later on. 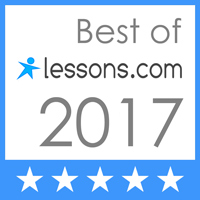 My main goal in teaching is to have a student build a strong foundation by developing good technique, timing, and an understanding of music theory and how it works in relation to the guitar. By knowing the fundamentals you can continue to progress for years after you’ve stopped taking lessons, in essence you’ll be teaching yourself. Do you teach a lot of songs? I teach a good amount of songs, I’ll teach a technique and use a song to apply it. It used to be that the only way to learn a rock tune was by ear or by having someone show it to you, but now there is so much printed guitar music available that I teach more reading, if you can read you can play whatever you want. Do you teach people to read music or do you use tablature? 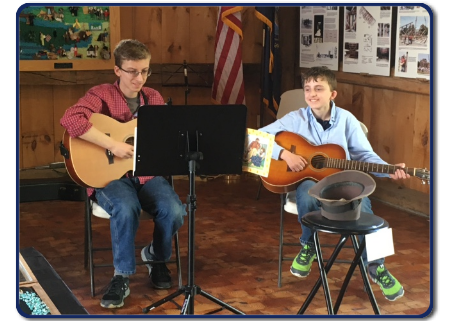 Learning to play the guitar takes a lot of concentration as does learning to read music, so I initially use tablature because it’s so easy to read that it allows people to focus on their main objective, playing the guitar. Reading music is a skill itself. I can read tab, but I sometimes have trouble making it sound like the song, what am I missing? It’s not you that’s missing something, it’s the tab that often times doesn’t give the notes any rhythm, especially the internet tab. The professionally written music will have both tab and standard notation, you can read the rhythm from the standard notation. I teach reading rhythmic notation even before standard notation. This depends on how good you want to get and how quick, as well as personel ability. For beginners 20 – 30 minutes a day might be a good place to start. For non beginners 30 minutes would be a minimum, if it’s much less you probably won’t get to far. Rock – Yes, lots of performance experience, classic to fairly current, all the standard guitar rock stuff, lead, rhythm, improvising, yup. 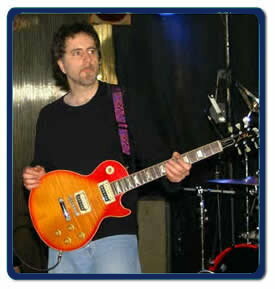 Blues – Yes, various rhythm guitar styles and solo improvising. 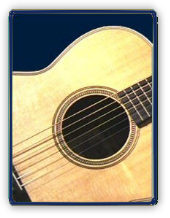 Fingerstyle – Yes, lots of styles, Travis picking, blues, ragtime, Celtic, alternate tuning, pop, song arranging. I perform all of this, I guess it might be my specialty. Classical – Yes, the whole classical technique thing. Standard reportoire, Sor, Guiliani, Bach, etc. Bluegrass – Yes, some. I’ve never performed it, but I teach a few tunes, great technique builders and lots of fun to play, everyone should play a little of this. Jazz – Yes, I played jazz when I was younger, not a strong style for me though, I teach chord voicings and some soloing, kind of like an intro to jazz guitar. Slide – I teach Allman Brothers style, I haven’t done much acoustic blues slide. Bass – Yes, a favorite for me. Rock to walking to slap.